You are here: Home / Recipes / Snacks & Treats / Cake Recipes / Ma Lai Gao (馬拉糕) – Even Softer, Fluffier & Tastier! Ma Lai Gao (馬拉糕) – Even Softer, Fluffier & Tastier! 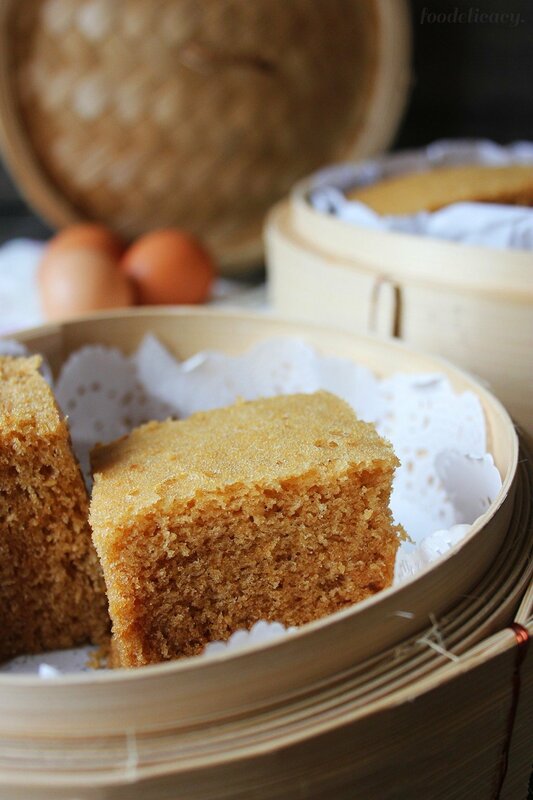 A very easy-to-follow recipe for a Chinese dim sum favourite, ma lai gao (馬拉糕), or Chinese steamed sponge cake, that’s extremely soft and springy, fluffy, and tasty! 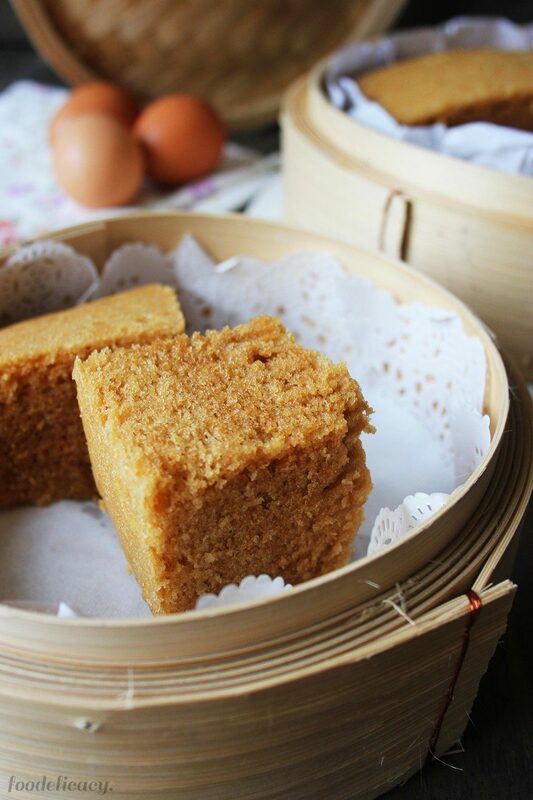 When you think of making ma lai gao (馬拉糕) or Chinese steamed sponge cake, think of the saying, “Good things come to those who wait.” Because patience and time is exactly what you will need in this traditional method of making this ever-popular Chinese treat. But, I promise, it will be so worth it! 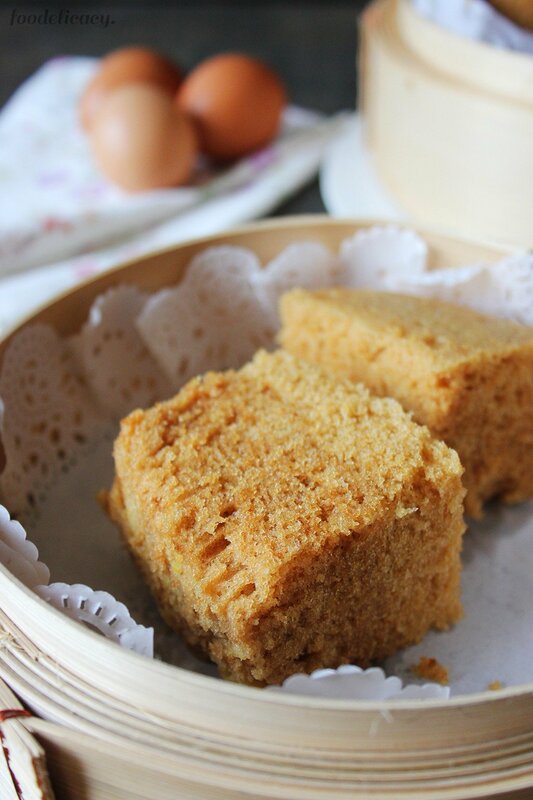 Hot on the heels of a successful attempt a few days ago, using the quick method for making Chinese steamed sponge cake, I was curious and intrigued by what I had read about making ma lai gao, the traditional way. I can’t say if this is an authentic recipe or method (have seen recipes that make a yeasted dough version), but the ma lai gao I made this way turned out even softer, finer, and fluffier in texture, and with a deeper, fuller flavour. I can’t say enough with just words, so I really hope the photo below says it better! What you don’t see in the photo, is that when I released my squeeze on the slice, the cake sprung right back up! It was really that springy! I also figured that if I was going to make ma lai gao the authentic way, I should be using the real tools to steam these cakes! So I went shopping, and bought myself a pair of bamboo steamers. Bamboo steamers are inexpensive, yet versatile and hardy vessels for steaming virtually any food – rice, noodles, vegetables, meat, seafood, or snacks and treats. It might be a good idea to buy at least 2 sizes, a larger one that’s about the same diameter as the pot you regularly use for steaming, or that can be placed on a steaming rack in a Chinese wok and be covered fully under the wok lid. A smaller one that can fit inside a pot fitted with a steaming rack, and be fully covered with the pot lid on, is ideal for making smaller cakes. The bamboo steamers I bought are roughly 20-cm (8-inch) and 25-cm (10-inch) in diameter. If you don’t have a bamboo steamer, worry not. You can use a standard cake pan (one that can fit in your steaming pot). Check out these helpful instructions here in my previous post. So, how is this method different from the quick method for making ma lai gao that I posted a few days ago? Primarily, the batter is allowed to rest for at least an hour, before adding the last few ingredients, and then steamed. I actually let the batter rest for slightly more than 2 hours, though it’s not uncommon to find recipes suggesting that the batter be allowed to rest overnight. Also, the use of a low-protein flour like cake flour, as well as custard powder, in addition to plain flour, contributed (in my humble opinion) to a much softer, finer texture. I’d seriously consider trying out a yeasted version next time, which recommends allowing the batter to rest for as long as 12 hours. But for now, this will be my #1 go-to recipe, as my family and friends absolutely raved about the texture and flavour of this ma lai gao! (a) Sift the flours and custard powder twice. When sifting, try to sift from a height a couple of inches above the mixing bowl, to incorporate more air into the flour mixture. (b) Whisk the eggs and sugar until the ‘ribbon’ stage. At ‘ribbon’ stage, the mixture should have paled in colour, thickened considerably, and tripled in volume – this may take 3-4 minutes (though I find that I usually need 5-6 minutes) in an electric mixer, depending on the speed and temperature of your eggs (always use eggs at room temperature). Simple test for ribbon stage: When you lift the whisk out of the batter, some of the batter on the whisk falls back into the bowl, making distinct ‘ribbons’ before slowly disappearing into the batter. (c) Use a light hand, with quick and light folding action, when folding in the dry ingredients, as well as when folding in the oil. Do not ‘slap’ the batter around in the bowl (due to a vigorous or heavy hand), otherwise, you will lose the air bubbles that you have worked so hard to incorporate, and the cake will be less airy, and denser. Ma lai gao is best enjoyed when eaten immediately, but will keep for up to 2-3 days when kept in an airtight container, in a cool, dry place. If eating a day or two after, re-steam the ma lai gao for a few minutes, and it will still be as good as the day it was made. 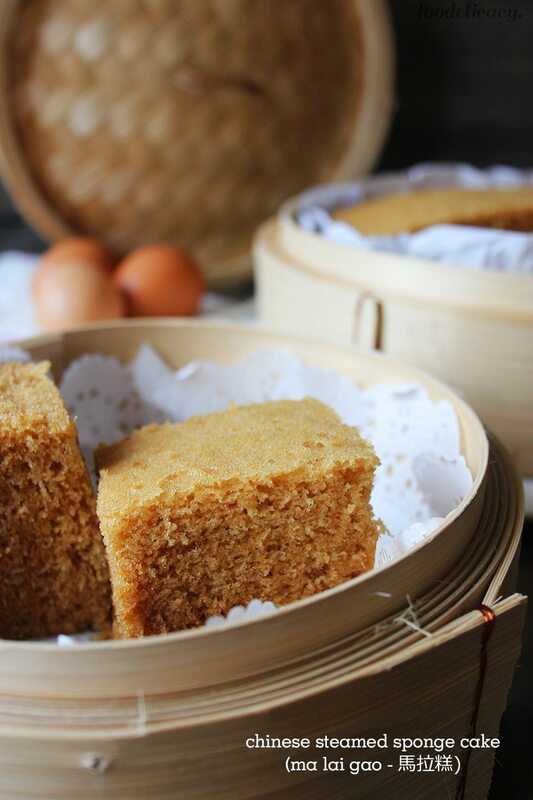 A very easy-to-follow recipe for a Chinese dim sum favourite, ma lai gao (馬拉糕), or Chinese steamed sponge cake, that's extremely soft and springy, fluffy, and tasty! (Adapted from source: 'Nonya Kueh' by Chef Ricky Ng). Combine plain flour, cake flour, and custard powder, in a mixing bowl, and mix well with a wooden spoon. Sift the flour mixture once, and set aside. In a separate mixing bowl, combine the brown sugar and white sugar, mix well, and set aside. Using an electric mixer fitted with a whisk attachment, whisk eggs on high speed (speed 4 to 5 on my Kitchen Aid mixer) for 15 to 20 seconds. While whisking, gradually add in the combined sugars, in a steady, continuous stream. Continue to whisk until the egg mixture turns pale in colour, thickens, and triples in volume (ribbon stage - see Recipe Notes below), about 5 to 6 minutes. Sift the flour mixture a second time. Divide the flour mixture into 3 portions. Fold the flour mixture, one portion at a time, into the egg mixture, using a light and quick hand. Cover the batter with a dry tea cloth, and set aside to rest for 1-2 hours. Meanwhile, prepare the bamboo steamer. 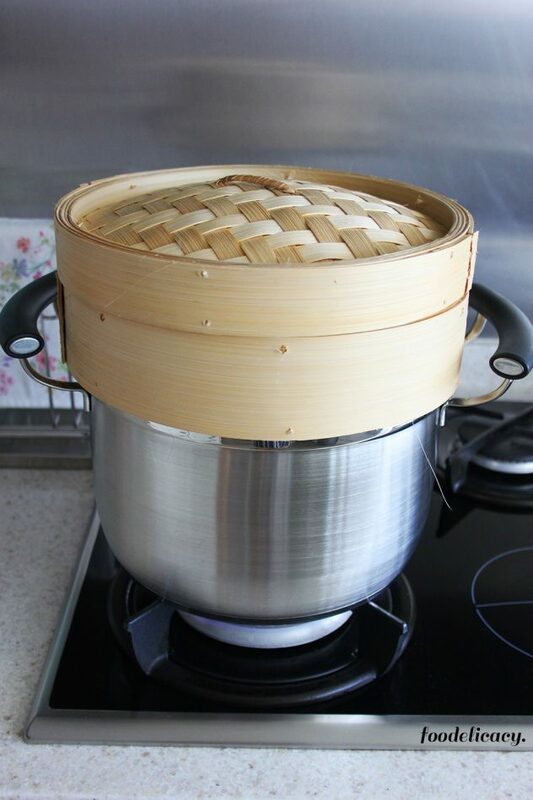 Line the base and sides of a 10-inch bamboo steamer with greaseproof paper. When batter has sufficiently rested, prepare enough water (for at least 30 minutes of steaming) in a deep pot and bring to boil, over high heat. In a small bowl, combine evaporated milk, honey, baking powder, and baking soda. Fold into the batter until well incorporated. Lastly, add the oil, and gently fold into the batter, until well combined. Pour the batter into the prepared bamboo steamer, cover with bamboo lid, set it stably over the pot of boiling water, and steam for 30 minutes, or until a bamboo skewer inserted into the centre of the cake, emerges free of sticky batter. Slice as desired, and serve immediately. #1. Steaming Equipment. There are a few options for setting up your steaming equipment. (a) Using a Chinese wok. Make sure that you use an appropriately sized cake pan that, when placed on the steaming rack in the wok, can be completely covered under the wok lid. (b) Using a 2-vessel steamer pot. Typically, this is the modern food steamer in which the bottom vessel holds the water, while the top has a perforated base and lid, to allow the steam to rise from the bottom vessel towards the top. Make sure you use a cake pan that can sit inside the top vessel, with sufficient room between the sides of the vessel and the cake pan (to facilitate placing the cake pan in the vessel, and taking it out), and with sufficient space between the steamer lid and the cake pan. The steamer lid must be able to fully sit on the pot, without gaps. #2. Amount of Water and Water Level. Whether using a wok or 2-vessel steamer pot, fill with sufficient water (depending on the steaming time required), leaving at least a 1-inch gap between the water level and the base of the steaming rack (in the case of the wok), or the base of the top vessel (in the case of the steamer pot). This will minimise the need to top up the water should the water evaporate too quickly. If you need to add more water, be sure to add boiling hot water to ensure a consistent steaming temperature, and to minimise drastic fluctuations in air pressure. #3. Preparing and Filling the Cake Pan. To prepare your cake pan, grease the base and sides of your cake pan, then line with greaseproof paper on the bottom and all around the sides. Fill the cake pan with batter not exceeding 2/3 of the pan’s height, to allow room for the cake to rise. Steam in batches, if your cake pan cannot accommodate all the batter at once. #4. Covering the Cake Pan. Once you've filled your cake pan with batter, gently lower the cake pan into the top vessel of the steamer, and place a dry tea cloth over the top, ensuring the cloth does not touch the batter. This is important, as the tea cloth will absorb droplets of condensation that form under the surface of the lid, and thus, prevent wetting the surface of the cake or turning it soggy. Place the top vessel back on top of the bottom vessel, and cover with the steamer lid. The water in the bottom vessel must already be gently boiling, before you place the top vessel (with the cake pan) on it. #5. Preparing the Cake Batter. Make sure you have your ingredients at room temperature. Be sure to whisk the eggs and sugar until the ribbon stage - goal is to trap as much air as possible. At 'ribbon' stage, the mixture should have paled in colour, thickened considerably, and tripled in volume - this may take 3-4 minutes (though I find that I usually need 5-6 minutes) in an electric mixer, depending on the speed used. Simple test for ribbon stage: When you lift the whisk out of the batter, some of the batter on the whisk falls back into the bowl, making distinct 'ribbons' before slowly disappearing into the batter. Use a light hand, with quick and light folding action, when folding in the dry ingredients. Do not 'slap' the batter around in the bowl (due to a vigorous or heavy hand), otherwise, you will lose the air bubbles that you have worked so hard to incorporate, and the cake will be less airy, and denser. The batter should be thick, but smooth. Lastly, to introduce the oil, it is a good idea to scoop out about 1/4 cup of the batter and mix it in with the oil, with a spatula by hand, until well blended, and then pouring it back into the rest of the batter. Finish up folding the oil mixture into the batter by hand, until well incorporated. Hi Noya, the recipe makes a 10-inch (25-cm) round cake. Usually, this should be enough for 8 to 10 servings, depending on how you slice it. I have found that this is such a light and fluffy sponge cake, that my family and friends often help themselves to more than a slice at a time. Hope you’ll give it a try! Hi, how many people does this recipe serve? Hi Cecilia, thank you for writing in! I’m so excited that you’re thinking of making this. A fair number of recipes here list ingredients in grams as weights typically yield more precise and consistent results, particularly when it comes to baking. In answer to your question, I do use a digital scale to weigh out both dry and wet ingredients. I’m sorry my site doesn’t automatically do the conversion, but are a lot of online resources that do, especially for commonly used ingredients, e.g.try typing ‘1 cup of xxxx in grams’ in an internet search, and you’ll easily get tons of suggested answers. Hope this helps! Hi! This recipe looks lovely, and I’d love to give it a try. Question about the measurements – I see in your ingredient list, you use ‘grams,” so does that mean you use a scale to weigh out your flours, or do you use a measuring cup? I live in the U.S. and so we’re not on the metric system. I’m use to using “cups” as measurement. Thanks! Hello Adelaine, thank you so much for giving this recipe a go! Sponge cakes are a little delicate, as it relies on trapped air bubbles (aided by leavening agents like baking powder and baking soda to give the cake a light and tender crumb, hence fluff?) in the whipped eggs to rise. Try whipping eggs to the required ‘ribbon’ stage, and when introducing flour, fold gently and lightly as possible. Overfolding can make the batter lose volume as well. I usually pour the batter straight from my mixer bowl into the bamboo steamer lined with baking paper on the base and all around, like any sponge cake batter. I also give it a few gentle taps on the counter to get rid of big air pockets. If you’ve had a chance to taste it, hope you enjoyed the flavour! Also, I leave the cake to cool in the steamer as well, after turning off the heat. The moisture helps keep it moist and won’t overcook it. All it needs is 5 to 10 mins re-steaming if it gets a little dry and it will be as good as the day you made it?. Thank you so much for sharing your recipe online. I tried making this cake yesterday and it looks not as pretty as yours but I’m still pretty happy with the result! I haven’t tasted it yet as I’ve cooked it for Harmony Day at work. I’m hoping it’s fluffy like most of the comments here! 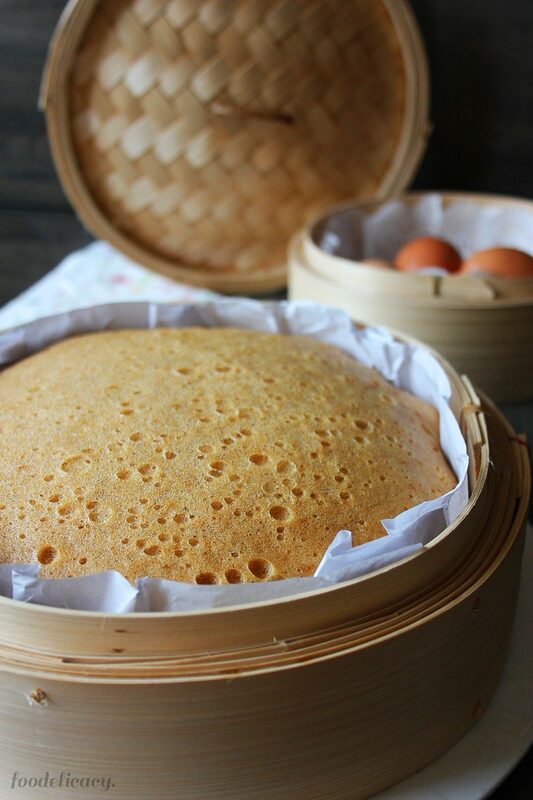 Just wondering if you have any tips on best way to pour the batter into the bamboo steamer? And is it better to leave the cake cooling in the bamboo steamer on top of the water or take it off completely? I’m wondering how you get such a beautiful round dome like cake. Mine was round when I first looked at it but as it cooled down, it sunk a touch is not as round and dome-like like yours. Thanks for your recipe. Really want to make this recipe, but I don’t have any cake flour, can I subsitute with self raising flour? If not, can I make this cake flour. Hi Ee Ling, so thrilled to hear you loved this! If you should have any leftover, all it needs is 5 minutes of re-steaming and it will be as soft and fluffy as the day you made it! Enjoy and thanks so much for writing in!? Thanks for sharing!!! I have tried this recipe and this is definitely a keeper! It is extremely soft and fluffy! Love the distinct custard and brown sugar taste as well!! Hi Laura, thanks for writing in! I haven’t omitted custard powder before, but I’ve read that a good substitute for it in baking is corn flour. Hope it works out well!? ps. sorry for the delayed reply, it’s been a hectic week!? I don’t have custard powder. What can I use to substitute? Or can I skip it? Hi Cheryl, this recipe doesn’t require resting overnight, just for 1-2 hours.? Helo, when resting the batter overnight, is it neccessary to put it in the fridge? Hi Rose, sorry I took a while to respond – it’s been a little crazy on my end?. Gosh, I’ll need to figure out the equivalent in US measurenents, and I know it can drive us crazy when recipes aren’t in the same measurements in use in our countries. I’ll need a little time to work on it, but you’ll hear from me when I’ve got it figured out. Hi, I’m excited to try this recipe but can you put it US measurements? Hi! I’ve never steamed a cake in a pressure cooker so I can’t be certain if it will work out well?. If you do decide to try, could you share how it goes, I’d love to know! Wishing for your success!!?? I just bought a stovetop pressure cooker. It steams at 8 or 15psi (depending on knob setting). I wonder if I can use it to make this cake? I will put in cake pan inside the stovetop pressure cooker. It should cook really fast since no steam escapes. Sure, Geri. I’d probably do the same myself?. Hope you like how it turns out! Do you think I can substitute the evaporated milk with plain milk? Can I check if it is ok to leave it cover just 1 hr? You are so welcome, Winnie! Thank you for dropping in and hope you’ll like the recipe! I’d love to hear how it turns out if you could share, ya? ??? Thank you so much for sharing!? So happy to know you were delighted with how this cake turned out! I followed your instructions. The cake came out great, and it tastes delicious. It was still soft and spongy the next day. Thank you for sharing. Thanks so much for sharing, Jean!! I’m keeping my fingers crossed for your success ?? Yes, Jean, I’m dying to know cos that happened to me once and I started over..ha ha!? Whilst letting my cake rest, I misread your recipe and went ahead to mix the baking powder, baking soda, honey and milk about 1.5hr ahead of time. And I could see the bubbling effect in the bowl. Wonder if it will make a difference to the cake? Shall update you…. haha! ? Hi Jean, thank you so much for your kind words and lovely comment!? If you live in Singapore, you can find these bamboo steamers from kitchen equipment supply stores like Sia Huat or Lau Choy Seng in Chinatown. I’ve also seen them in HDB shops selling housewares. 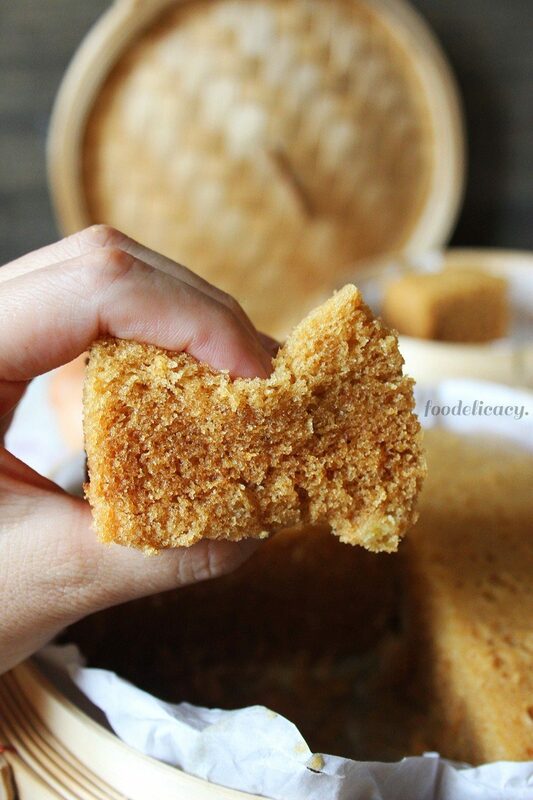 Though I think that you can still get soft and fluffy ma lao gao in a regular cake pan. The texture of the cake could be more a result of how the batter was handled. Either way, I’d love to hear from you if indeed the bamboo vessels make the difference!? Thank you for sharing your wonderful blog with very nice pics! That must have taken a lot of effort, time & passion. ? Could you advise where to shop for the bamboo steamers pls. My daughter has tried this recipe before without the bamboo steamers but the cake was not as soft or fluffy. She thinks these bamboo steamers does make a difference. Thanks. Hi Jessica, ooooh…so glad it worked out so well for you! ?? ?Thank you so much for sharing ?With any leftovers, just re-steam (covered) for 10 to 15 mins and the ma lai koh will be as soft and moist as the first day! I always have extras from this recipe (just hubby and me who can only eat so much) so I often give away and re-steaming works like a charm!? I am back! I didn’t have time to make it again until now, and I actually invested in a bamboo steamer just for this recipe. I follow all the instruction this time. My family said it was the best mai lai koh out of all the others ones I made. Definitely very moist and spongy and super delicious. Though, the next day the cake was kind of dry. I never encounter this problem due to the fact my family usually finishes everything! But, I made this one pretty late at night. Definitely making this again. Thanks for sharing your recipe! Hi Jessica, I loved reading your entire ‘baking’ episode, it was hilarious!?? Thank you so much for taking the time and effort to tell me what you DID do, I think you’re so confident and cool to have gone along with your own plan and flow (even when stuff you didn’t plan for happened!) and see what comes out. I would have been in a panic attack! So kudos to you! I’m glad the flavours, if nothing else, gave you a hint of how wonderful this cake really is. I hope all goes well with this cake for tomorrow, you should get a lovely moist, tender and fluffy cake!?? I’d love to hear all about it…if you could spare the time and effort! Have a wonderful week ahead! Thanks for your advice… Am glad I came across your blog. Thank you for the recipe. Would sure be trying it soon .. May i know if i could just do without the honey? Hi! That’s awesome! Thank you so much for sharing, I’m so glad you’re pleased with how it turned out. 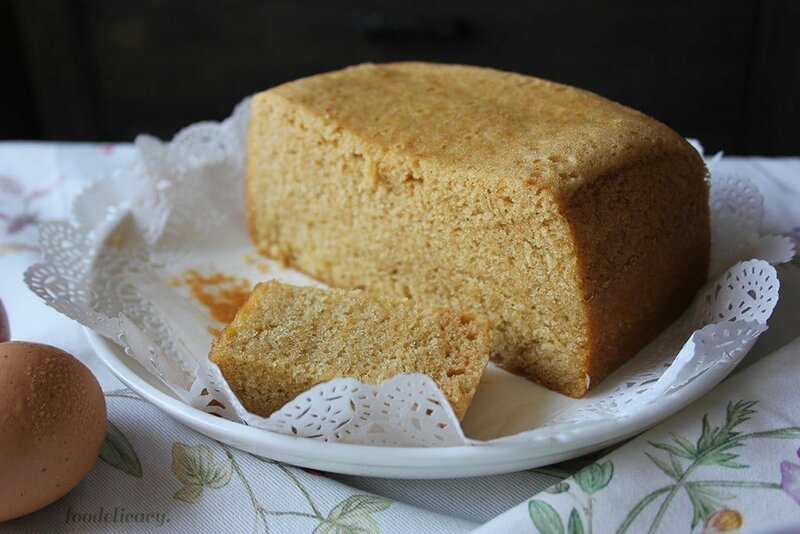 By the way, this cake is as good as when first steamed even a day or two later – just re-steam the slices you want (covered with a tea cloth as before) for a few minutes to get that moist and springy texture. Enjoy! Hi! Oooh…how exciting! I hope I’ve gotten back to you in time..so here it goes, when steaming in a wok, you can either cover with the bamboo lid OR a dry tea cloth, the idea being to prevent drops of condensation from wetting the surface and turning it soggy as the cake steams. And then, just put the wok lid on top. At least, that’s how I would do it. I usually use the tea cloth method, as I don’t want the bamboo lid restricting the cake as it rises. Hope this helps! And please, please do let me know how your cake turns out! I hope you’ll enjoy it! Thank you for your recipe! I am making it right now. Question: When using a bamboo steamer in a wok do I have to cover it with the bamboo lid and then the wok lid? And do I have to use a cloth as well? The cake looks lovely. Any eggless version or can you suggest any substitutes for the eggs.? Ooooh i love this cake! Am tempted now to do one for myself. Did u use the egg beater shaped like spring form to beat the eggs? I remember my neighbours using that to turn out real fluffy cakes. Enjoy!